Getting lost in a maze is a lot of fun, almost as much as smugly locating the centre. 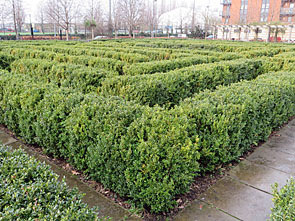 So it's good to know that London has five (I think only five) hedge mazes in which you can get properly lost. And I don't mean labyrinths, which have only one path to the centre, I mean proper mazes with junctions, dead ends and everything. Here's my guide to the puzzling quintet - three of which are free to enter, and four of which are worth a visit. This is the grandaddy of UK mazes, the first 'puzzle' maze in the country, created by George London and Henry Wise to entertain the court of William III. It sits on the northern edge of Hampton Court's gardens, accessible without having to buy a ticket to the whole estate, should you be so tempted. It's also a bit of a masterpiece of interactive design, being neither too easy nor too hard, whatever Jerome K Jerome might have thought. The current version isn't quite the original design - three short sections of hedge have been removed at some point, increasing the opportunity to loop and decreasing the length of the dead ends. The maze is essentially in two parts, a west bit followed by an east bit, the latter slightly easier to get lost in. The yew hedges are also very well maintained, thick and green even in winter, with no embarrassing holes to push through for a shortcut. I like the disorienting nature of the paths, which are adept at concealing which way you're really heading, and the occasional glimpses of the centre when you're technically nowhere near. Once inside the maze you're free to wander round as much as you like, so maybe try to improve on your performance, which I did manage in three minutes on my final attempt. There's not much in the centre at present bar a sculpted iron frame to take a family-selfie, which every family does, and then the way out's through a gate just down the path, whenever you're ready. For a blow by blow simulation, here. For lots of background information, here. Crystal Palace Park is on the large side, so you may never have stumbled upon its maze (which is nowhere near the dinosaurs, but over on the northern side near the Concert Bowl). And yet this is the largest hedge maze in London, circular in shape and 160 feet in diameter, laid out on an artificial mound behind a screen of trees. 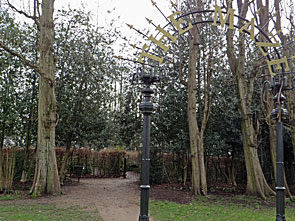 The original is almost 150 years old, a late addition to Sir Joseph Paxton's pleasure gardens, and known as the Tea Maze because it was somewhere to stroll after afternoon tea. Increasingly rundown, the whole thing was given a major makeover in 2009 to celebrate the centenary of Girlguiding (an organisation founded after a group of girls petitioned Baden Powell at a Boy Scout rally in Crystal Palace Park). The Guides and Brownies have done a fine job, replanting the hornbeam hedges and scattering ten granite monoliths around the paths (each bearing a patrol emblem from the natural world). A particularly nice touch is the perfect reproduction of the maze across the paved circle in the centre, plus benches if you need a rest, which you might well. I was amazed when I checked my watch to discover that I'd taken 15 minutes to reach the middle, such is the combination of technical challenge, cul-de-sacs and looooong paths. The hedges are particularly threadbare at present, perhaps because they're still young, but all are unbroken so that taking a shortcut is never an option. Meanwhile a particular difficulty at the moment is the mud, with most of the footways affected, so maybe best wait until later in the year if you don't want your trainers coated. But it's good this one, if you like your grey cells tested or simply a decent linear workout. For further information, here. For the official leaflet, here. When I say Bunny Park, I do of course mean Brent River Park, between Hanwell and Southall. The bunnies are in the animal centre at the top of the slope, near the cafe, while the maze covers a landscaped square lower down. It was built for the Millennium, using precisely 2000 yew trees (for that special millennial touch). There's also a hint of council-friendly child safety about it, as the whole thing is overseeable from a wooden ramp, on which mums and grandads stand and watch while their littl'uns run amok below. From the entrance there are three ways to go, one straight to the middle, and the other two off to either side. Both lead eventually to the centre, initially with brief dead ends as distractions, then via unbroken spiral paths that feel more difficult than they really are. 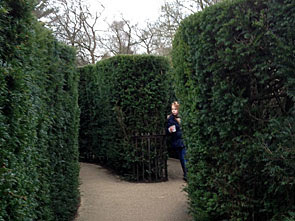 Although most of the hedges are solid (occasionally backed up by wooden fencing), unsupervised access means that several are now breached, allowing the unscrupulous solver to sneak through and cheat. This doesn't always work, indeed I watched one competitive Dad sidestepping through and finding himself back near the start, but the net result is a hedge maze in gradual decline. Your prize for reaching the centre is the opportunity to climb a squat wooden tower and look out towards those coming after you. It's no great intellectual challenge, but a satisfying riddle to solve all the same. 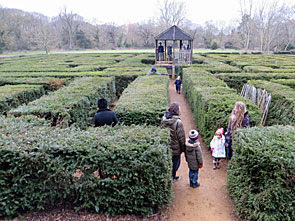 This maze lies on the northern edge of London, in deepest Enfield, only just inside the M25. It's hidden inside the grounds of Capel Manor, a horticultural college for the country's budding Titchmarshes, and which opens regularly for members of the public in search of back garden inspiration. At this time of year that's weekdays only, but the extensive grounds are much prettier to explore in spring and summer, and then the entrance fee doesn't seem so steep. The maze fills one landscaped corner near the Japanese Garden, approximately elliptical in shape and in the Italianate style. It was designed by Adrian Fisher, probably Britain's most acclaimed mazemaker, who has a penchant for mirrors, overpasses and towers. Capel Manor's maze has a central tower, a proper high one, all the better for surveying the route by which you've arrived. In this case there are no dead ends, merely various intersecting paths, but this means you can go round in circles a lot, and holding one hand to the left or right wall won't get you to the middle. Don't come specially for the maze, I'd say, but if gardens are your thing then Capel Manor and Myddleton House down the road make for an excellent day out. And finally, to a nice try in East London. Coronation Gardens were opened by Leyton Council in 1903, the crowned head in question belonging to Edward VII. A century later lottery money was used for a revamp, part of which led to the creation of a hedge maze in the rose garden. This is at the far end of the park, immediately behind the Tommy Johnston stand at Leyton Orient's Brisbane Road stadium, and overseen by the parkkeeper's offices. 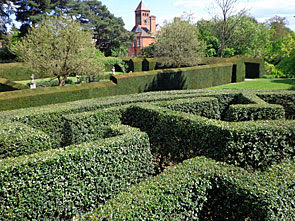 The maze is precisely rectangular in shape, approximately 20m by 15m, and consists of a network of stone paths running between box hedges. They're very low hedges too, no more than waist height, which means it's easy to scan across and spot where the five dead ends are in advance. It's also very easy to step through the hedges where they turn a corner, this thanks to years of misuse which have created threadbare gaps. On my visit I was joined by a small boy whizzing round the maze on his scooter, taking full advantage of the breaches to make a mockery of the intended puzzle, while his mother glowered at me as if wondering why an over-18 year-old was attempting to walk the route properly. I left pretty soon after, dodging the dogs exercising by the bandstand, but a nice try, Leyton, if you're ever in the area.